Williams Heating & Air Inc is proud to serve the Red Bud community! 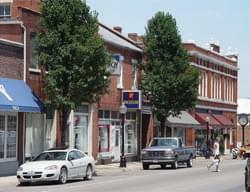 About Red Bud, IL - Happy to be your hometown Heating & Air Conditioning Contractor! Red Bud is located in Randolph County, Illinois, and according to the 2010 census the population was 3,698. This city is the location of Southwestern Illinois Collegeâ€™s Red Bud campus. It gets its name from the presence of the redbud tree, which is a special species of flora that grows in the area. This region is in a transitional zone between a humid subtropical and humid continental climate, and it has four distinctive seasons. Red Bud is home to several attractions that may be of interest to visitors and residents. The Arts and More Gallery, Lincoln Park, and Ratz Memorial City Park are all located in Red Bud. Also located near Red Bud is Waterloo, which is home to several golf courses like the Acorns Golf Links and the Ridge Club Golf Course.